The nXe amplifier from Ashly Audio The What: Ashly Audio has expanded its nX-Series of multi-mode amplifiers to cover low power applications. The new nX family models deliver 75W or 150W per channel in a single rack unit frame that can house either two or four channels. Like all the models in the nX series, these start out with the base model (nX models). The What Else: The nXe models add Ethernet for monitoring and control. The nXp models feature the networking and built-in Protea DSP matrix processor. Optional Dante or CobraNet cards can be added to nXe or nXp models. 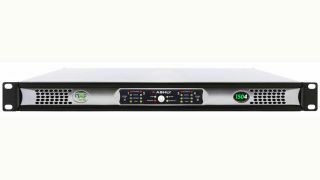 These multi-mode power amplifiers allow users to drive low impedance (2, 4, 8 Ohms), or 25V, 70V, 100V constant voltage systems output via rear panel dip-switches. All nX-Series amplifiers offer comprehensive energy management features, which can make installations a little greener. The nX amplifiers are built in the company’s Webster, NY factory and are covered by Ashly’s five-year warranty. The Bottom Line: The new two and four-channel by 75W and 150W complete the family of nX power amplifiers. Output choices range from a four-channel amplifier rated to deliver 3,000 watts per channel into 2 Ohms all the way down to a dual-channel 75W amp.